Treat your feet to some well-needed rest with the new Foot Pillow by Pillow Art. Standing at 10 inches high with a 15-inch diameter, this pillow is filled with tiny styrofoam beads, giving the pillow a soft, cushiony feel. It’s the perfect compliment to your office because you can stash it under your desk and use it as a comfortable foot rest. At home you can use it to prop up your feet while sitting on your couch watching TV. 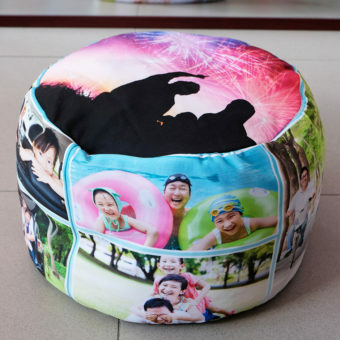 You can customize your Foot Pillow with up to 18 of your favorite pictures. Just add the item to your shopping cart and then you’ll be prompted to upload your images. We’ll then create a free layout for you which we’ll ask you to approve before production. 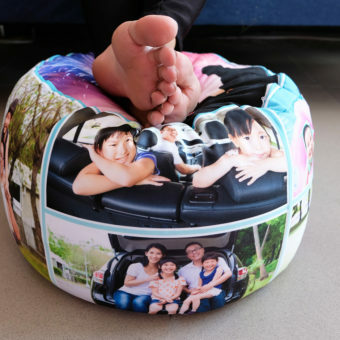 The customized Foot Pillow by Pillow Art – a great gift for the home or office. This entry was posted in Blog, Gift Ideas and tagged foot pillow, foot rest, foot support.